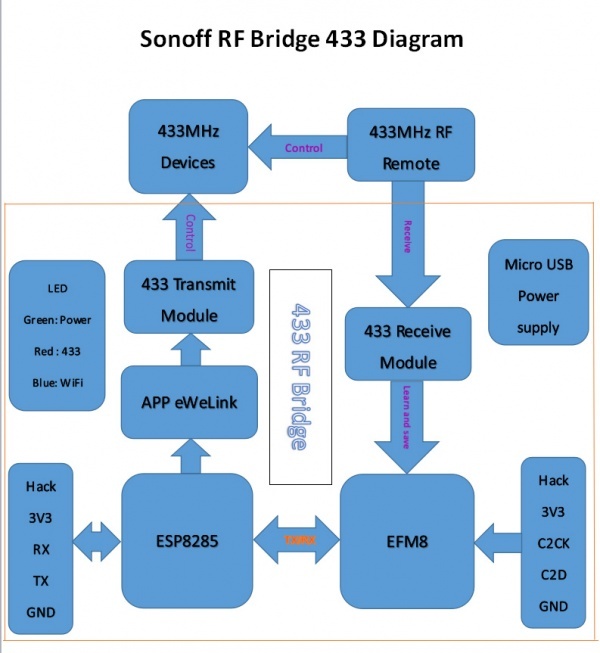 Sonoff RF Bridge 433 is an ultra low power consumption device that can convert 433.92MHz (433MHz) to WiFi. 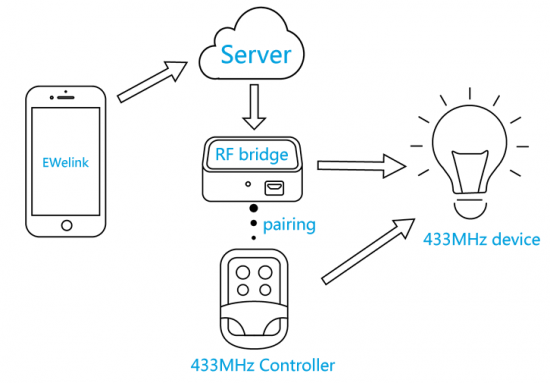 It's a bridge between 433MHz RF and WiFi, which can be added to iOS & Android App eWeLink. Users can firstly pair 433MHz devices with the RF Remote, then add their RF Remote to the App. Therefore, users can control the 433MHz devices through App eWeLink. It's specially designed for mobile device and IoT application. From the picture, you can see the relations among the devices clearly. Firstly, you pair the 433MHz RF Remote controller with 433MHz device. Secondly, you add RF Bridge to App eWeLink. Thirdly, add the 433MHz RF Remote controller to RF Bridge via App, pair the buttons one by one. Then you can press the button on the App to turn on/off the 433MHz device remotely. One RF Bridge supports to add up to 4 RF Remote controllers. You can add not only 1-4 buttons ordinary RF Remote to the RF Bridge on App, but also curtain RF Remote and Alarm. Please note that you can't see device status changes on the App. Adaptive rate fallback algorithm sets the optimum transmission rate and Tx power based on actual SNR and packet loss information. The receiving supports fixed code encoding, like PT2260, PT2262, PT2264, EV1527, etc. The device is powered by micro USB cable. The power is supplied to the system through 3.3V LDO chip.